SHARP WHY SHARP AIR PURIFIERS? Sharp Plasmacluster Air Purifiers Feature Superior Quality Conventional Air Filtration System. Sharp Plasmacluster Air Purifiers Use Patented Active Air Purification Technology, Exclusive to Sharp! Sharp Plasmacluster Air Purifiers - the World's Most Awarded Air Purifiers. Sharp Plasmacluster Air Purifiers - Ultra Energy Efficient Air Purifiers. Sharp Plasmacluster Air Purifiers - Cost Effective Air Purifiers. Sharp Plasmacluster Air Purifiers - Safe Air Purifiers. Sharp Plasmacluster Air Purifiers - User Friendly Air Purifiers. Washable PreFilter traps large dust and dirt particles. Prefilter protects fine True HEPA filter from contamination by large particles and extends HEPA filter's lifetime. Washable(!) Granular Carbon Filter (FPN60CX and FPN40CX models) effectively removes from the air over 4000 chemicals including, cigarette smoke, cuisine and pet odors, cleansers, formaldehyde, ammonia, etc. Pocketed Granular Carbon filter is washable and reusable for a period of up to 5 years. True HEPA Filter is placed the last one downstream the air flow. This placement ensures that all particles that may be released by other components of the air filtration system and trapped and do not pass to the clean air outlet. Apatite Anti-Microbial Filter combined with True HEPA filter, helps kill bacteria and microbes on contact. Plasmacluster Ion Device releases the balanced shower of negative and positive ions in the air to purify the entire volume of the air in the room. High quality of air filtration materials used and careful filter's design result in extended filters lifetime. The lifetime expectancy of True HEPA and Granular Activated Carbon Filters in Sharp Air Purifiers - up to 5 Years(!) under normal residential conditions and normal use. Sharp Plasmacluster Air Purifiers is a Technological Breakthrough in air purification. 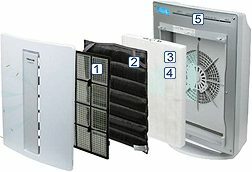 Along with Superior Quality conventional Passive air filtration system, Sharp Air purifiers employ a Unique Active Air Purification Technology. This technology is called Plasmacluster Ion or PCI. PCI generates a balanced shower of positive and negative ions by splitting the molecules of water in the air. Doing so, the Plasmacluster Ion device Doesn Not Produce any Ozone(!) unlike the conventional Ionizers used in most other air purifiers, that may produce Ozone as a by-product. The ions have a property of forming the cluster around microscopic particles in the air, thus, surrounding harmful airborne substances such as, fungi, microbes, viruses, pollen and other allergens and deactivating them. This way, Sharp Air Purifiers are able to recreate the natural chemical process that purifies the air in the Earth's Atmosphere. This advanced active air purification technology is highly effective in removal from the air most airborne contaminates and allergens, including viruses, bacteria, microbes, mold spores, germs, fungi, plant spores, pollen and other odor causing substances. The experiments conducted by testing institute in Japan demonstrate that Plasmacluster Ion technology has the ability and power to reduce mold fungus by 90% in one hour. Another test results showed that 99.7% of the viruses exposed to the ions die within 40 minutes. PCI technology also proved to be very effective in neutralizing many chemicals in cigarette (tobacco) smoke. Sharp has become the First company in the world to successfully replicate Nature's own air purification process. The Plasmacluster (PCI) Technology is patented in over 40 countries worldwide and is Exclusive to Sharp Products! How Sharp Plasmacluster Ion Works? With over 60 patents pending and numerous international awards, Sharp air purifiers go beyond conventional purification systems and are ideal for those who are sensitive to dust, allergens, pollen and other impurities. Sharp was recently presented with the Takagi Award in Japan. This Award is given for Breakthroughs in Science and Technology. This is the First Time the Takagi Award has been awarded to a consumer products company. The Asthma Society of Canada recognizes the ability of Sharp's Plasmacluster Ion Technology to reduce airborne asthma and allergy triggers. The Sharp Plasmacluster Air Purifier system has been awarded the British Allergy Foundation Seal of Approval. The multiple experiments conducted by research Institutes Worldwide demonstrate the unique ability of Sharp Plasmacluster Ion Technology to inactivate fungi, bacteria, microbes, bacilli, etc. Since their introduction in 2003, Sharp Plasmacluster Air Purifiers quickly became the # 1 Selling Air Purifier Brand in Japan, South Korea, China. The unique features of Sharp Plasmacluster Air Purifiers are widely recognized by the medical communities in the USA, Canada and Europe where their popularity is growing at a fast pace. Sharp Plasmacluster Air Purifiers are Ultra Energy Efficient Air Purifiers. The Ultra Energy Efficient Direct Current (DC) Electric Motor requires only 54 Watts of power on High Speed setting. On Low Speed setting the power consumption is mere 3 to 5 Watts. This is about 10 times lower than the power consumption of other conventional air purifiers on the market. All this brings the operating cost of Sharp Plasmacluster Air Purifiers down to less that a Penny a Day. Sharp Plasmacluster Air Purifiers are Cost Effective Air Purifiers. Large amount of true HEPA filter media ensures large filtration capacity and extends HEPA filter's lifetime. Unlike most other air purifiers that employ cloth-embed dust carbon, Sharp Air Purifiers (FPN60CX and FPN40CX) use relatively large amount of Granular Activated Carbon(!) Activated Granular carbon filter has much higher filtration capacity than cloth embed dust carbon. Moreover, the evenly distributed pocketed Granular Carbon filter is Washable and Reusable. Under normal use and in normal residential conditions both True HEPA and Granular Carbon Filters do not require replacement for up to Five Years! This results in Hundreds of Dollars of Savings on the cost of replacement filters over the period of few years. Sharp Plasmacluster Air Purifiers Do Not Produce any Toxic Off-Gassing. All components of Sharp Air Purifiers are made of high quality non off-gassing materials that produce no off-gassing. Unlike conventional Ionizers used in many other air purifiers, that produce ozone as a by-product, Sharp Plasmacluster Air Purifiers Produce No Ozone. The natural emission of ozone from Sharp Plasmacluster Air Purifiers is Less than 0.01 ppm (particles per million). This is Five Times Lower(!) than the Consumer Electronics Safety Industry Standard of 0.05 ppm. All this makes Sharp Air Purifiers the extremely clean devices and absolutely safe for use by people with hyper or multiple chemical sensitivity. Sharp Plasmacluster Air Purifiers are equipped with number of essential features making these units very easy and fun to operate. 4-Speed DC Electric Motor Whispers in Operation and makes the units Library Quiet. Sharp Air Purifiers - up to 50% Quieter than most other air purifiers on the market. There is a choice of Full Auto, Special Program (Pollen) and Manual operating modes. Separate Particle and Odor Sensors provide precision Air Quality control in Full Auto mode. Full Function Remote Control gives extra convenience and comfort in operation. 8-Hour Off Timer gives you a piece of mind. Sharp Plasmacluster are lightweight air purifiers. Along with the well balanced Comfort Carry Handle they are easy to carry from room to room or up and down stairs. Multi Functional LED Display displays the current operating mode of the unit, current air condition and reminds when it's time to clean or replace the filters. Slim Space Saving Design of Sharp Plasmacluster Air Purifiers requires minimal space and allows place the units Right Against the Wall. Long lasting HEPA and Carbon Filters (filter's lifetime up to 5 years) save you hundreds of dollars on the cost of replacement filters. Elegant Stylish Design of Sharp Air Purifiers blends perfectly in any Decor.